Biting is a very natural action to most dogs. It’s a basic, instinctual behavior that puppies learn in order to move around the litter. Biting dogs, either puppies or adults, can be problematic for many families. Puppy bites are irritating, and adult dog bites can be dangerous, especially when children are involved. When faced with a pet that bites, you have many avenues to try to correct the problem first. However, if none of these methods work, getting rid of the dog may be a necessary last resort. Look for a behavioral root cause for biting. While the root cause for biting in puppies is almost always play, determining the root cause of biting in older dogs can be more challenging. Determining a root cause can also help you determine if and how the dog can be corrected. The dog could be dominant and bites to keep his status as pack leader. A dog also may be biting from fear; abused animals typically bite to protect themselves from being hurt again. Even an animal with no abuse background will bite if it perceives danger. You should look at all possible causes for fear such as hurtful or overly rambunctious children or other dominant animals. Territorial biters only bite when someone gets too near food bowls, beds, toys or the boundaries of the yard. Dogs may also bite because they simply don’t know any better and have not had strong obedience training in the past. Rule out medical conditions. All dogs will bite if someone gets too close to or touches a tender or painful area of the body. If your dog starts to growl and snap only when you're getting close to a particular part of his body, take him to a veterinarian for treatment. If your dog loses his hearing or vision, he's more likely to begin biting, especially when surprised or scared. If you are in doubt about any medical conditions, take your dog to a veterinarian for a full exam. Take your dog for a psychological evaluation. If you have tried but cannot find a root behavioral or medical cause, take your dog to a veterinarian, dog trainer or animal behavior specialist. Dogs that bite consistently without an apparent reason may have a mental condition that causes them to bite. Prevent your puppy from becoming a biting dog with early training. Puppies need immediate and firm conditioning in order to learn not to bite. 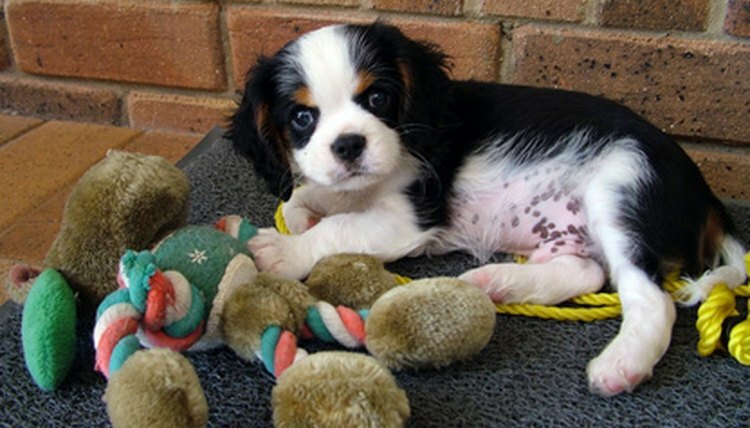 Have toys readily available for your puppy to play with or chew toys to gnaw on, especially during teething. If your puppy bites during play, immediately give a high-pitched yelp, much like another puppy would, so they will recognize that biting hurts. Firm, loud verbalization and a minute of ignoring your puppy after he bites should help him learn to stop. Train your older dog not to bite based on a root cause. If your dog bites out of dominance, train him with dominance. Only feed your dog when he comes on command and sits, insist that every command is followed, and enforce boundaries of what is the dog’s area, and what is not. For territorial biters, clearly define your dog’s area with a kennel or fence. If your dog is territorial about a piece of furniture or room that isn’t his, then ban him from that area or remove the furniture all together. Dogs that bite out of fear need self-confidence. Reassure and reward your timid or skittish dog when he stays calm. Positive rewards for good behavior and socialization can help your dog. Hire a dog trainer: Hire a trainer if your own methods of training aren’t working. Trainers may have some special tricks dog owners do not know to use. The trainer can also give more specialized insight into the biting dog’s behavior. Give up the dog if none of the methods succeed. If your dog has a serious mental condition, or bites several times no matter how much training you give it, it may be time to remove him from your home. Dogs with mental conditions usually have to be euthanized. Territorial dogs or dogs that bite out of dominance may also need to be euthanized or placed with a dominant owner who is capable of retraining. Dogs that bite out of fear may simply need new, more calm surroundings. If your dog is given to a new owner, you should fully disclose the nature of the dog and the extent of the problem beforehand. Be very patient with biting dogs and puppies; effective training is key. If children or other small animals are in the house, a muzzle may be required for their protection. If your dog does not stop biting, it is important to give the dog up to prevent injuries to yourself, children, other pets or strangers. Why do My Birds Bite Each Other's Face?